Quick Answer: Big Hero 6 uses real scientific ideas and principles as the foundation for all its fantastic futuristic fun. Some of the science is decades away from becoming possible in applications similar to what's seen in the film, while other aspects aren't that far off at all. Robotics labs even have Baymax-like creations in the works. Big Hero 6 (2014), like most Disney movies, is a well-researched film which uses concepts rooted in reality to tell a fantastic story. Futuristic fiction is always best when it extrapolates on existing concepts audiences can recognize, giving the film an element of believability of how the future might be. For Big Hero 6, the filmmakers met with robotics experts at Carnegie Mellon University, a Pittsburgh-based institution internationally renowned for its robotics research, as well as labs at Harvard and MIT. Early in the film, protagonist Hiro Hamada (Ryan Potter) invents “microbots,” tiny robots capable of responding to neural stimulation to form and construct nearly anything from a person’s imagination. In reality, such a technology would be one of the most incredible (and potentially dangerous) inventions in the history of man -- in the film, Hiro is using it to gain admission to a robotics college. While microbots are miles away from reality in terms of actuator technology, neural response, sustainable power and motion torque, tiny robots that could serve as very early precursors to such grand equipment do exist. And much of the other technology in the film -- from GoGo’s (Jamie Chung) maglev wheels to Hiro’s lovable, huggable nurse-robot companion Baymax (Scott Adsit), are much closer to being reality than one might expect. "It has to be grounded in a believable world," Big Hero 6 director Don Hall told Gizmodo. He speaks on behalf of the fact Big Hero 6’s heroes use self-designed science as their “powers” to save the day. "Their superpowers are their intelligence, and that's a great message," says producer Roy Conli. "It's really a celebration of the nerd." 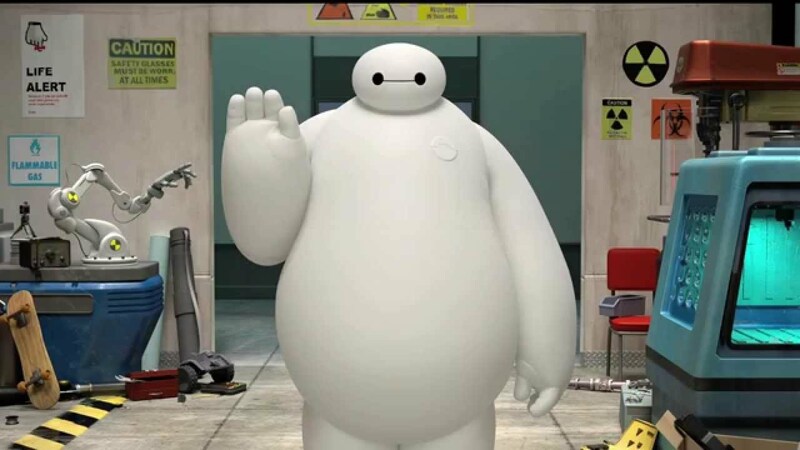 Big Hero 6’s co-lead is Baymax, an inflatable vinyl robot designed to provide medical attention of all kinds. He is programmed with 10,000 medical procedures, can perform a full-body diagnostic scan of any human in two seconds, and will not deactivate until the patient is helped. Among the robotics experts the filmmakers consulted was Chris Atkeson, a professor at the Robotics Institute and Human-Computer Interaction Institute at CMU. At CMU, they learned “soft robots” with goals like that of Baymax are in development and could someday exist. Atkeson and his former colleague Siddharth Sanan have spent the last 14 years exploring the uses for inflatable robots, particularly in the areas of health care. When asked how close we are to a robot like Baymax, he replied, “I think it’s very soon. We haven’t gone for a complete system. But we have gone for parts of it. The design that we could do very soon, like a carbon fiber skeleton and pneumatic actuators internally, is possible.” Whether or not it’s actually the right type of design for that function is another argument. However, a Japanese robot called RIBA-II does exist and looks an awful lot like Baymax, capable of picking up a human being and putting them down again. Honda has also created Asimo, a big white robot that looks similar, albeit less cuddly, than Baymax. He is presently the world's most advanced humanoid robot capable of performing many simple human operations. The real-world fundamentals for the film’s concepts don’t stop with Baymax -- Go-Go Tamago’s “powers” come in the form of maglev discs, which she uses as rollerskates, shields, and throwing weapons. It is a friction-free technology that offers no resistance, thus giving her great speed and control. Maglev technology is a reality in high-speed railways constructed in several places around the world. With them, the rail car hovers above the track on a magnetic cushion, allowing the train to travel at speeds of over 300 mph. Wasabi’s (Damon Wayans Jr.) trademark tool is a plasma-based cutting mechanism which gives him sword hands. Earlier in the film, he builds a wall out of the material and uses it to slice an apple into paper-thin sheets. Plasma cutting technology has been in development since the 1960s, and today plasma scalpels exist in the medical field for precise, bloodless surgical cutting. Honey Lemon (Genesis Rodriguez) is the film’s resident chemist, and her skills come from a great understanding of chemical compounds and combinations. She is equipped with a fancy purse boasting a keypad shaped like the periodic table. She punches in combinations of chemicals and the purse ejects a sphere with those elements, allowing her to throw them and elicit the desired reaction. While her method of dispersement seems a little fantastic for real-life, the foundation of her skills is pure chemistry. Finally, Fred (T.J. Miller) fulfills his fantasy of becoming a fire-breathing “kaiju,” or a Japanese monster of epic size. Fred adopts a Godzilla-esque dragon shape, operating it from a control center behind the eyes like a huge mech. Strange as it may be, people are actually developing large-scale human-controlled mechanized robots. In addition to all that, the University of Pennsylvania’s GRASP lab has created flying nano quadrotors, small robots that can fly in synchronized swarms with incredible accuracy and which look a tad similar to Hiro’s microbots. The most amazing reality might be DARPA’s Targeted Muscle Re-innervation technology for prosthetic control. This video shows a prototype in which a prosthetic arm is being controlled using brain signals. Big Hero 6 is a fun and adventurous film full of wild ideas and fun science. It is also an optimistic picture about a world in which technology can be used for the benefit of everyone, and where science and intelligence are seen as the greatest powers a human can possess. And, as it turns out, the reality of some of its incredible-looking concepts aren't that far away.